CRAZY DISCOUNT! Was: $299.95 Now: $59.97! Build a small basketball club today! This 1.05-1.65m Kid Portable Basketball Hoop Stand let You have own basketball court and play basketball anytime at your house! 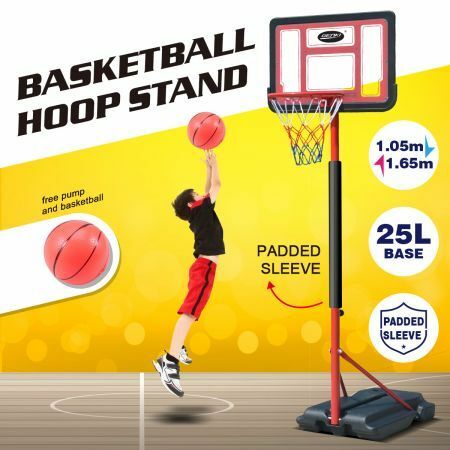 The height of hoop can be adjusted between 1.05m-1.65m to cater the kids and youth player's preferred height. Coming with a rectangle shatterproof backboard, the basketball stand has a good rebound performance. There is a protective sleeve on the pole to keep the player from bruising. Made of blow molding PE, the base is durable, and it can be filled with 25KG of water to stabilize the foundation. What's more. The basketball stand is equipped with a basketball and a pump, which ensures you play basketball at once! Playing basketball is more than a game. You can practice basketball skills or exercise the body. More importantly, the activity allows you to interact with friends or family members. Great transaction.but has issues with delivery.